As Caritas Australia’s annual Lenten fundraiser Project Compassion draws to a close this weekend, supporters have gathered to pray, fast and give for the most marginalised. For Project Compassion 2019, which has focused on the theme “Hope”, Caritas Australia highlighted the stories of six people whose hope and strength in the face of trying circumstances “keeps us from discouragement; sustains us during abandonment, opens up our hearts and leads us to the happiness that flows from love” (Catechism of the Catholic Church, 1818). Caritas Australia chief executive officer Paul O’Callaghan said Project Compassion creates a unifying spirit in the nation’s Catholic community. “Project Compassion is a galvanising force in the work of Caritas Australia. This Lent, the theme of ‘Hope’ is the banner beneath which Catholic community organisations, schools and parishes are gathering to pursue a just world, at peace and free of poverty, where all people live with dignity,” Mr O’Callaghan said. Across the nation, here are some of the ways that Caritas Australia supporters came together in various ways this Lent in unity for the organisation’s community development work across the world. 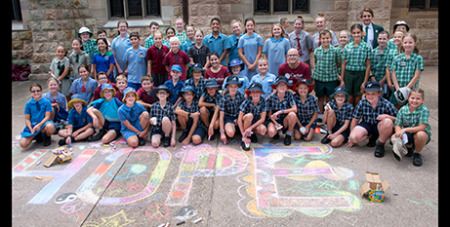 In Brisbane, 500 students and teachers celebrated the theme of hope with a liturgy led by Archbishop Mark Coleridge at St Stephen’s Cathedral last month. “At the heart of Caritas is a simple philosophy: we help people to help themselves. Since it began in 1965, Project Compassion has been vital to our capacity to fight poverty, tackle injustice and uphold dignity,” said Kerry Drysdale, Caritas Australia’s Brisbane-based justice educator. In Sydney, St Ursula’s College Kingsgrove students were inspired to take the “spirit of Project Compassion” out into the world and the wider community. Super Dube from Caritas Zimbabwe told students how the organisation is working in communities across his country to create improved access to water through better infrastructure. To donate, visit www.caritas.org.au/projectcompassion or call 1800 024 413.